For other uses, see Sinpo (disambiguation). 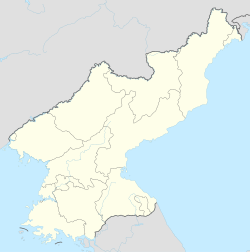 Sinpho (Korean pronunciation: [ɕin.pʰo]) is a port city on the coast of the Sea of Japan (East Sea of Korea) in central South Hamgyŏng province, North Korea. According to the last available census, approximately 158,000 people reside here. It is an important base for fishing, with a recent government emphasis on aquaculture. The DPRK has created aquacultural cooperatives and a central aquaculture office in the city. In 1985 or 1986, the Soviet Union announced it would build a nuclear power plant, in an effort to persuade North Korea to join the International Atomic Energy Agency. According to South Korean sources, the plant was to be located in the Sinpo District, and construction began in 1990, but later ended due to pressure from IAEA, and economic difficulties in the Soviet Union. In the 1990s, the Kumho area of Sinpo was the site of two planned reactors which were to have been built by the Korean Peninsula Energy Development Organization (KEDO) with international support. The project was later cancelled by the United States in 2002, amidst claims of a breach in a 1994 agreement on North Korea's nuclear weapons programs. Preparation work on the site began in 1996, and a groundbreaking ceremony took place in 1997, with construction originally expected to be completed in 2003. Workers were removed from the area in January 2006, and the project was officially terminated in May that same year. Sinpo is a major hub of the Defense industry of North Korea, and the Sinpo South Shipyard, its shipyards, have produced the Sinpo-class submarine, and is adjacent to the Mayang-Do Naval Base and a land-based SLBM launch platform. Also, the SINPO-C ballistic missile submarine (SSB) and the SINPO-class experimental ballistic missile submarine (SSBA) were built in the shipyard. Sinp'o is reportedly close to the site of a severe railroad accident in 1995, with over 700 civilians killed. Those who died were passengers from the lower classes, packed into standing-room only cars. The survivors, mostly party elites and their relatives, were in safer cars at the front of the train. Sinp'o Station is on the P'yŏngra Line of the Korean State Railway. Sinpo has a humid continental climate (Köppen climate classification: Dwa). ^ "Sinpo". Federation of American Scientists. 1 March 2000. Retrieved 16 April 2017. ^ a b "Shinpo, North Korea". power-technology.com. Kable Intelligence Limited. Retrieved 16 April 2017. ^ "Geumho-Jigu Light Water Reactor Site". Nuclear Threat Initiative. 30 September 2011. Retrieved 16 April 2017. ^ Cook, Damen (March 27, 2017). "North Korea's Most Important Submarine Base". The Diplomat. Archived from the original on March 31, 2017. ^ a b "North Korea's Submarine Ballistic Missile Program Moves Ahead: Indications of Shipbuilding and Missile Ejection Testing". 38 North. Retrieved 11 December 2017. ^ Demick, Barbara (2009). Nothing to Envy: Ordinary Lives in North Korea. New York: Spiegel & Grau. pp. 139–140. ISBN 978-0-385-52391-2. Retrieved 16 April 2017. ^ "Climate: Sinpo". Climate-Data.org. Retrieved July 26, 2018. This North Korea location article is a stub. You can help Wikipedia by expanding it.